We highlight research issues for wireless networking in aerial systems consisting of multiple small autonomous drones. Among these challenges are video streaming, synchronization, security and safety, and interference management. reliable aerial networking for robust multimedia streaming (SINUS). Further multi-UAV projects are under way and planned, respectively. Networking aspects and data communication in these multi-UAV systems play(ed) key roles in these projects, crucially supporting the tasks of multi-UAV coordination and aerial sensing of the environment. Which lessons did we learn? The communication requirements in a multi-UAV system are manifold (Andre et al. 2014, Hayat et al. 2016), including: aerial-ground communication to send control data from a ground station to the UAVs, and feedback and sensed data (e.g., images, videos) from the UAVs to the ground, over various distance and height configurations (3D communication); aerial-aerial communication among the UAVs to exchange control and sensed data, and to support mission control, flight formation, and collision avoidance, where the UAVs are highly mobile in terms of position in 3D space and flight dynamics (pitch, roll and yaw). The building blocks of a multi-UAV system, i.e., the UAV platforms and their flight dynamics, networking and communication, multi-UAV coordination, and the task of sensing the environment, are highly interdependent. Communication networks thus have to be designed, tested, and deployed in close interaction with the other components. Experience and general guidelines for these development tasks are still missing. We experimentally performed evaluations of aerial-aerial and aerial-ground communication over WLANs, using both infrastructure and ad hoc modes, various IEEE 802.11 WLAN variants, and specific antenna designs (see, e.g., Yanmaz et al. 2013). The overall conclusion is this off-the-shelf IEEE 802.11 WLAN hardware is not well suited for 3D communication and agile network nodes. High variance in throughput, non-predictable latency and jitter, multi-UAV network disruptions and partitioning may arise, in particular when large areas have to be covered with few, limited-range UAVs. A reliable wireless technology that can sustain high throughput as well as low delays and jitter over long ranges is still to be developed. Depending on the application, cooperative relaying (selected UAVs operating as relay nodes) or/and specific network- and application-layer protocols are needed to support the multi-UAV mission, in particular coordination and sensing. Examples are the use of delay-tolerant networking (DTN) protocols and/or of error-resilient real-time data transmission, in order to cope with network fluctuations and (temporary) disruptions. A complementary approach to deal with communication constraints is to adapt the payload data (e.g., pictures or video) in terms of quality and, hence, data rate requirements to the network conditions at hand. We experimented with two options: (1) dynamically configuring a UAV’s camera settings depending on a crucial parameter indicating the current aerial-ground station link throughput conditions; (2) using JPEG2000 pictures for incremental image mosaicking. While these approaches served us well in our case studies, such a communication and adaptation facility is closely tied to, and has to be designed and implemented targeted to, the specific application requirements and networking situation at hand. Autonomous, collaborative 3D environment reconstruction and navigation of the UAVs will have to be supported. A mobile ad-hoc network must be established in the air without any network infrastructure that supports real-time communication of control information (e.g., coordinates), descriptive information (e.g., image descriptors), and visual data (e.g., (patches of) images, possibly videos). The network will be modified according to link availability/reliability, latency, and data rate conditions. Effective data representation, compression and error-resiliency techniques will have to be designed. Collaborative sensing poses strict requirements on the temporal synchronization between aerial vehicles, since 3D reconstruction is only possible when all information has a common time basis. Due to the quest for complete autonomy, time synchronization via GPS or network infrastructure cannot be assumed to work. A solution that synchronizes all UAVs in a decentralized manner over a wireless network and fulfills application-specific precision requirements is needed. In a number of applications, e.g., movie production, surveillance, or emergency response, images need to be transmitted or/and videos need to be streamed wirelessly from multiple senders to multiple receivers (multipoint-to-multipoint) in an ad hoc fashion. Multipoint-to-multipoint coordination using distributed algorithms needs to be developed to provide virtually contention-free channels. Security and safety of an autonomous multi-UAV system will be of utmost importance, safeguarding it from attacks by hackers and adversaries. While this task in itself is a major challenge, it should at the same time be possible for law-enforcement agencies, for instance, to take over control of such a network in case it exerts threats or is being abused. For example, suitable interference management techniques need to be developed to protect the network against unintended radio jamming while allowing intended lawful interception. The aspect of interference management raises the question of the frequency intervals available for UAV communications in the radio spectrum. All our experimental work was done in the unlicensed bands for IEEE 802.11. In the long term, one should discuss the availability of a dedicated spectrum for mission-critical UAV networks, e.g., in case of disasters. 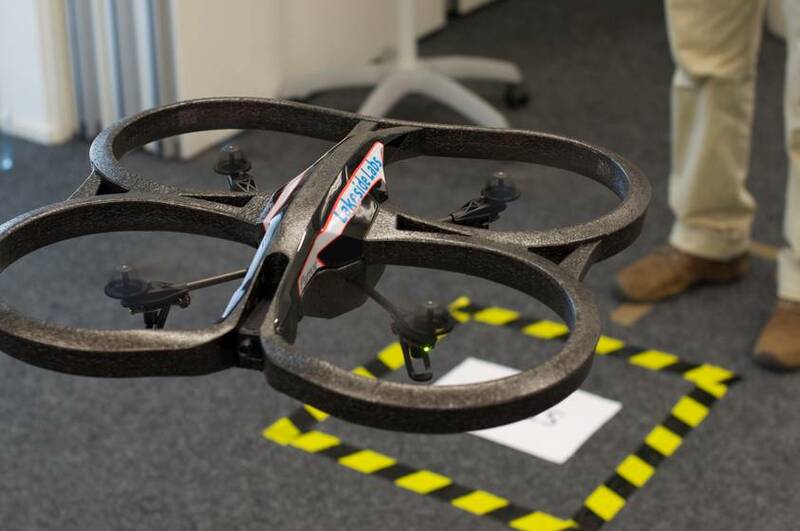 It is interesting to note that multi-UAV systems are increasingly used for creative businesses, e.g., picture and movie productions, and arts performances, e.g., the “Drone 100” project by Intel and Ars Electronica Futurelab. Currently, such missions and performances are pre-programmed. It would, however, be highly interesting and productive to team up with creative persons and artists and enable them to interact with such a massive UAV swarm, e.g., by instructing it on-the-fly to change formation, colors, or figures drawn into the sky, basically offering an alternative to today’s fireworks or other aerial shows. Technically, this would probably result in new and challenging networking research issues. In other words, creative persons or artists could give valuable feedback on how multi-UAV networks (technology, in general) should advance. T. Andre, K. A. Hummel, A. P. Schoellig, E. Yanmaz, M. Asadpour, C. Bettstetter, P. Grippa, H. Hellwagner, S. Sand, S. Zhang. “Application-driven design of aerial communication networks”. IEEE Communications Magazine, May 2014. S. Hayat, E. Yanmaz, R. Muzaffar. “Survey on unmanned aerial vehicle networks for civil applications: A communications viewpoint”. IEEE Communications Surveys & Tutorials, quarter 4, 2016. E. Yanmaz, R. Kuschnig, C. Bettstetter. “Achieving air-ground communications in 802.11 networks with three-dimensional aerial mobility”. In Proc. IEEE Intern. Conf. on Computer Communications (INFOCOM), Turin, Italy, 2013. E. Yanmaz, S. Yahyanejad, B. Rinner, H. Hellwagner, C. Bettstetter. “Drone networks: Communications, coordination, and sensing”. EAI Endorsed Transactions on Mobile Communications and Applications (submitted). Hermann Hellwagner and Christian Bettstetter are professors at the University of Klagenfurt in the South of Austria. They perform research and teaching in the area of communication and computer networks with emphasis on multimedia and wireless mobile systems. This essay was also published at Dronehub K, where you can leave comments or simply let us know whether you liked it. Update: This work will be presented at the 2017 Networking Conference (TNC) in Linz.